Confused about whether you should go low-carb or low-fat? Wondering whether wine or beer is healthier? Concerned that your diet is making a health condition worse? Foods That Harm, Foods That Heal sets the record straight on what to eat to prevent or treat a wide variety of ailments. The first edition of this pioneering guide changed the way we view food and its impact on our bodies. Since then, researchers have continued to uncover the effects -- both good or bad -- of food on cancer, stress, inflammatory bowel syndrome, and other common conditions. More than 170 foods, from apples to zucchini plus simple ways to eat, cook, and store each food to maximize its healing potential. More than 100 health conditions -- from arthritis to varicose veins -- with quick tips on what to eat to prevent or treat each ailment. 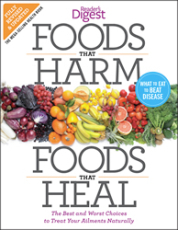 An all-new overview of nutrition and food safety, including the role of phytochemicals in health; the potential dangers of pesticides, food additives, and genetically modified crops; and the best healthy cooking methods. Special features on the benefits of vitamin D, the real deal on high-fructose corn syrup, the dangers of mixing food and medicine, and much more. Let food be your medicine, and let Foods That Harm, Foods That Heal be your prescription.